Research into ways of improving the quality and quantity of intercontinental telephone lines has been an ongoing focus for a number of years. One of the first underwater telephone cables, laid between France and the United States in 1956, provided an extremely limited capacity of only 36 channels. The transmission of televised programming was non-existent. Programs were recorded manually on a magnetic tape, and ten dispatched by airplane courier to its destination studio, where is would be "replayed" in order to disseminate its contents to spectators. In April 1961 a multi-national agreements was signed between the American Telephone and Telegraph Company (AT&T), Bell Telephone Laboratories (Bell Labs), NASA, the British Post Office, and the French National PPT (Post Office.) This agreement established a joint collaboration for the project development of two active, mobile telecommunications satellites, "TELSTAR" and "Relay." The first Radome was only temporary, and was installed in order to house the construction site for the antenna. Both this temporary shelter and the final Radome measured 64 meters in diameter. 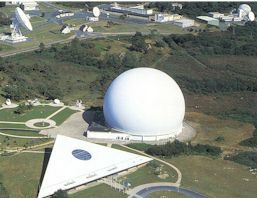 The final Radome, installed in France in the summer of 1962, is now a museum. It is made of Hypalon coated Dacron and weighs over 30 tons. TELSTAR I was launched from Cape Canaveral (now the Kennedy Space Center) on 10 July 1962. TELSTAR I was placed in an elliptical orbit (completed once every 2 hours and 37 minutes), rotating at a 45 degree angle above the Earth's equator. The maximum transmission time between Europe and the United States was 20 minutes per pass. On 11 July 1962 the TELSTAR Satellite transmission was received in Pleumeur-Bodou, enabling the world's first satellite transmission of a short television program from the United States. This page was last edited on 8 February 2016, at 18:17.